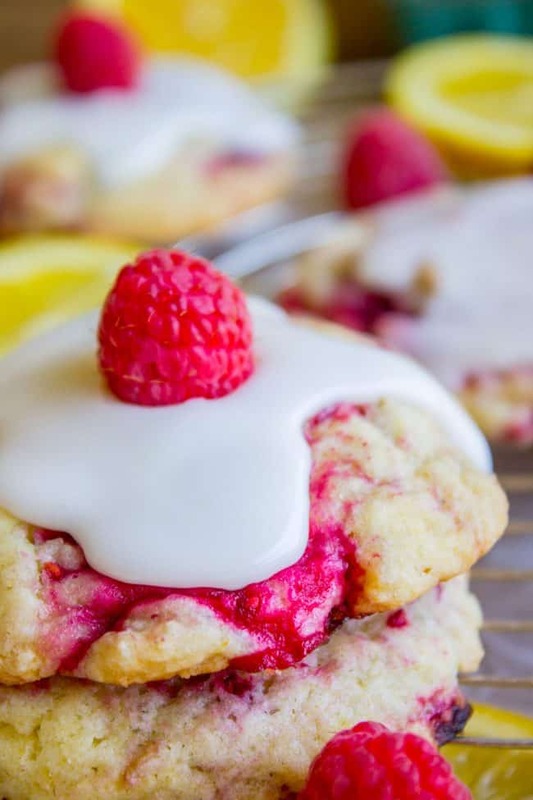 These Fresh Raspberry Lemon Cookies are absolutely bursting with flavor! It’s like summer in the shape of a cookie. There are fresh (frozen) raspberries in the dough, and fresh lemon juice and zest. The glaze puts them over the top! 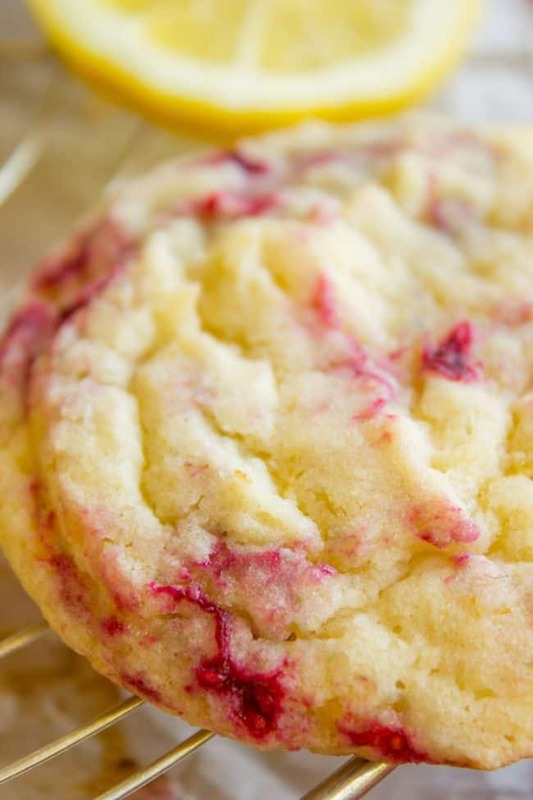 I cannot even tell you how many batches of Raspberry Lemon Cookies I have made over the past month. Sooo many. These were definitely a labor of love! My dedication to all things raspberry and lemon is strong. So naturally I used the older one, because my mom taught me to be frugal and responsible and all that. I measured it out and dumped it in, and as I’m mixing up the dough, I think to myself, huh, lemon extract smells kinda weird I guess. Oh well, it must be the alcohol, I’m sure it will bake off in the oven. Famous last words. It did not bake off in the oven because it wasn’t alcohol I was smelling, it was completely rancid. How do you not notice this?? Like seriously, sometimes my brain tries to help me out. It gives me clues, like, “dude this smells weird.” Why don’t I listen to it?? If something smells funny, don’t put it in your cookies!!!! Moron! The cookies were terrible and I dumped them straight in the trash. 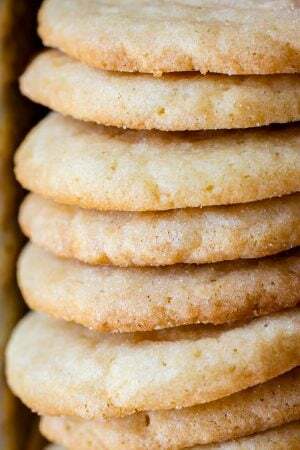 There is nothing sadder than seeing an entire batch of freshly baked, beautiful looking cookies in your trash can. But, I persevered. I used the other jar of lemon extract on the next batch and found out that lemon extract is kinda chemically, even when it’s not rancid. Or maybe I just used too much. 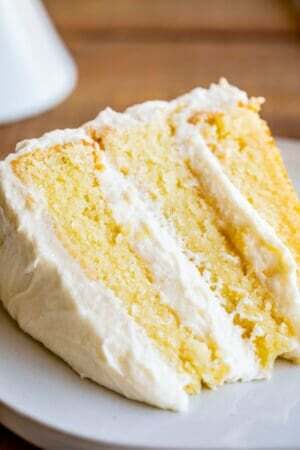 (Do you guys have any recipes you love using lemon extract?) Anyway, the cookies didn’t taste lemony enough, so I moved back to testing with lemon juice. You just can’t beat the fresh, bright flavor of fresh lemon, I guess. I love these cookies all by themselves and ate way too many of them. 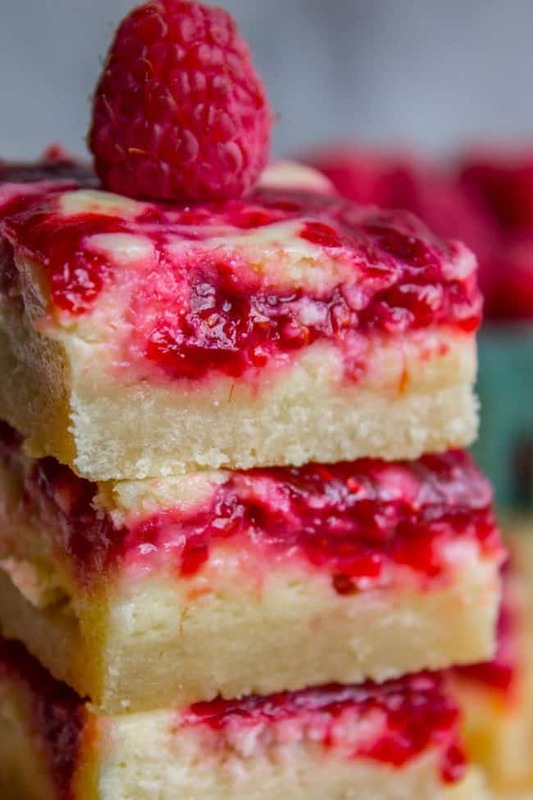 But when you drizzle it with lemon glaze and top it with a fresh raspberry?? These cookies are unstoppable. SO good and the perfect summer treat. 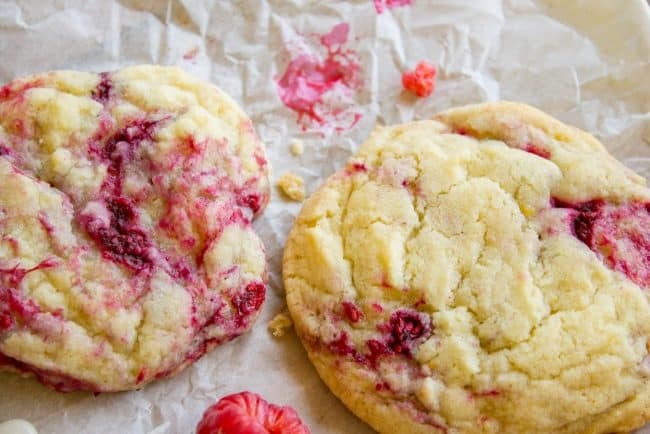 Just like I mentioned in my last cookie post for these Soft Chocolate Cookies with Peanut Butter Frosting, these raspberry lemon cookies are kind of an experience. The glaze and fresh raspberry on top make them feel super fancy. They would be great for a summer BBQ, or a bridal/baby shower, or anything where presentation is important. Just look how pretty they are! They are so easy to make. There is no chilling required for the dough, so you can go from zero to cookies in about 30 minutes. Buy a microplane grater to make zesting a manageable, even pleasant experience. It’s one of my favorite kitchen tools!! 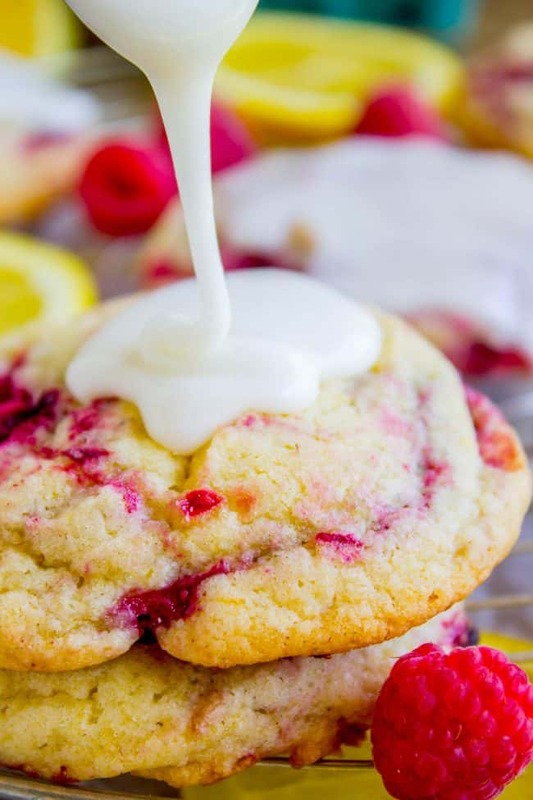 These Fresh Raspberry Lemon Cookies are absolutely bursting with flavor! It's like summer in the shape of a cookie. There are fresh (frozen) raspberries in the dough, and fresh lemon juice and zest. The glaze puts them over the top! Preheat your oven to 350 degrees F. Line a baking sheet with parchment paper or a silpat. Don't get the raspberries out of the freezer yet, leave them in until the very last minute. In a large bowl or stand mixer, beat together the butter and shortening for 1-2 minutes, scraping the sides and bottom. Add the sugar and lemon zest and beat well, another 1-2 minutes, until fluffy. Add 1 tablespoon lemon juice and the egg. Beat well. Get the raspberries out of the freezer. 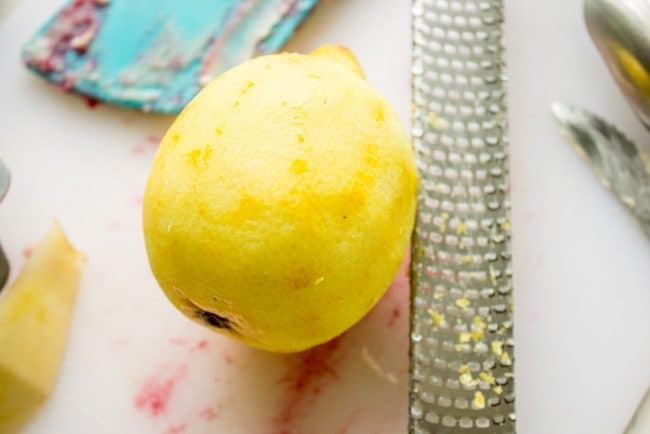 Measure out 3/4 cup onto a cutting board and chop roughly with a sharp knife. 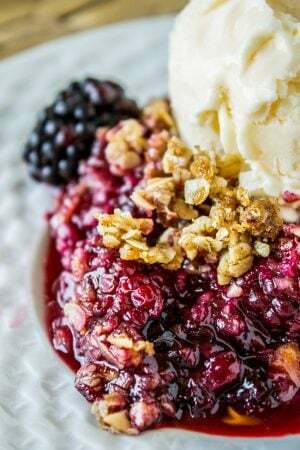 You want each raspberry to be at least chopped in half but not much more than that. Break up any big clumps. Carefully stir the raspberries into the dough with a spatula or wooden spoon. 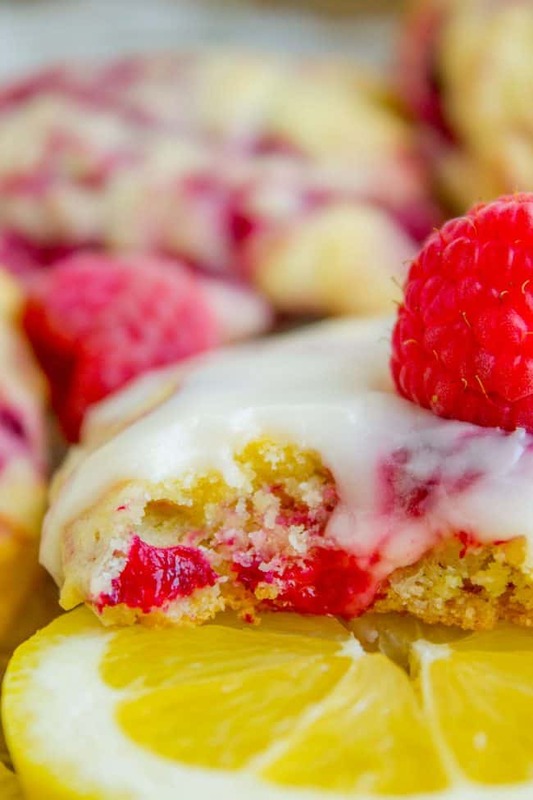 Don't over mix; you want there to be sections of lemony dough that don't have raspberries in them. If you mix too much it will turn all the dough pink. Use a cookie scoop to immediately shape all the dough. You should get about 15 cookies. Add 6-8 to the prepared pan, at least 2 inches apart. Bake at 350 for 14-15 minutes, or until the edges have barely turned golden. Make sure that the top of the cookie is not too shiny. If it still looks raw in the middle, leave it in for another couple minutes. Bake the remaining cookies right away once the oven is free. Bake them the same amount of time. If you want to save the other cookies for later, transfer the shaped dough to a ziplock freezer bag. You can freeze it for up to 2 months. (I do this with all my cookies! Cookie dough freezes beautifully.) Don't thaw before baking. Just plop them on the pan and throw it in a preheated oven. You might need to increase the baking time by a couple minutes. Let baked cookies set on the pan for 5 minutes, then transfer to a cooling rack. Let cool completely. You can speed this up by putting them in the fridge or freezer if you want. Use a spoon to glaze the cookies. 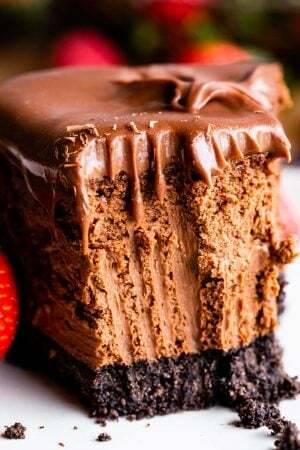 Let the frosting set at room temperature. 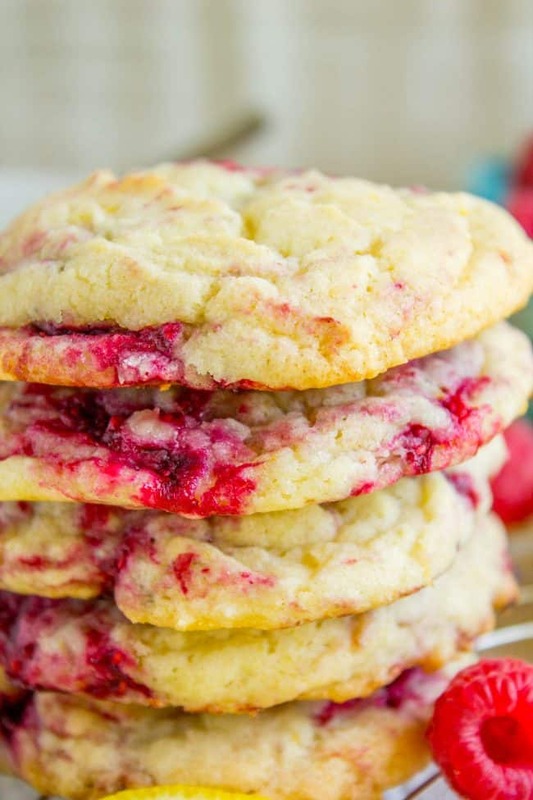 Top each cookie with a fresh raspberry. These cookies are best served on the day you make them. Store leftover cookies in the fridge. More delicious cookies you will love! 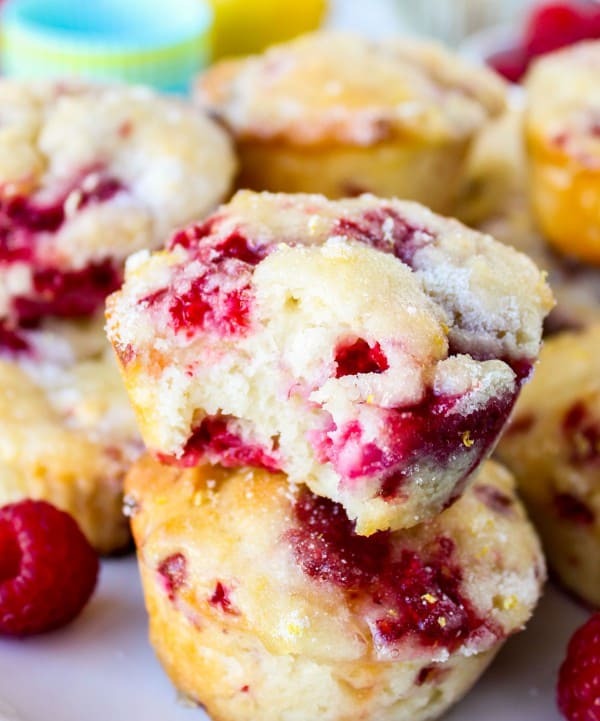 Raspberry Lemon-Glazed Muffins << these are the muffin version of today’s recipe! 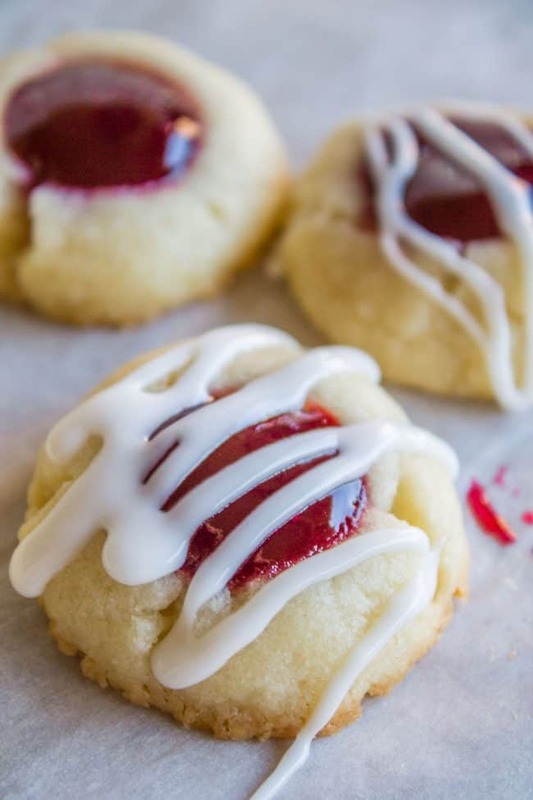 Raspberry Almond Thumbprint Cookies << these are a classic! Have you made them?? 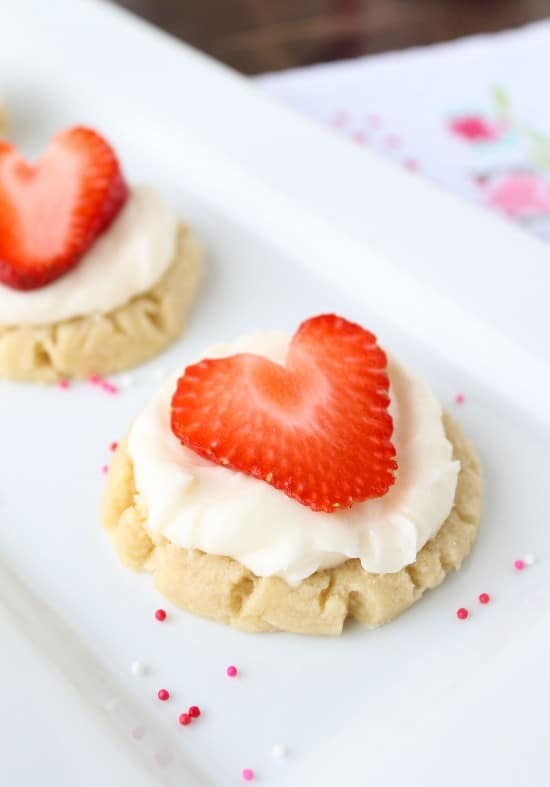 Coconut-Frosted Sugar Cookies with Strawberry Hearts << I LOVE these. Why are cookies so good?? 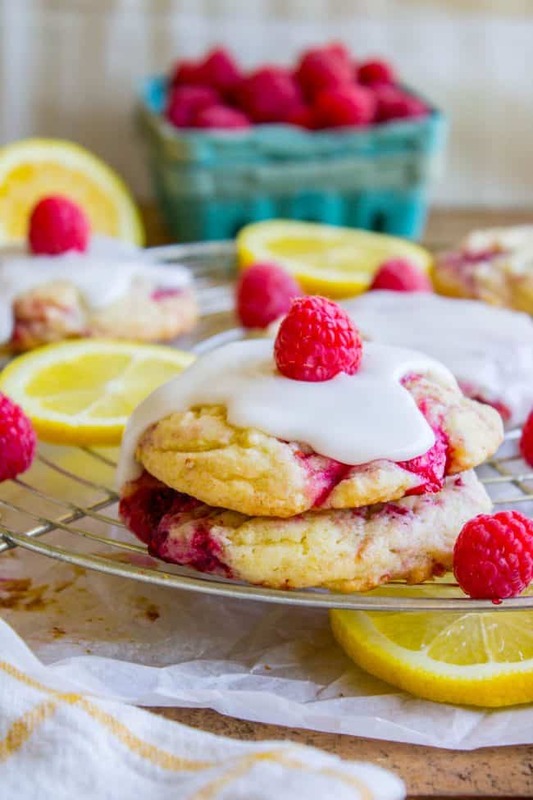 More lemon raspberry flavors from other bloggers! Recipe sounds delicious! Has anyone tried a version with egg substitute? I haven’t Kathy! Is there a recommendation for how much to use per egg on the packaging? Loved this recipe…. Defiantly a keeper. The flavor was amazing! I followed the recipe exactly except I had fresh not frozen raspberries. The texture was a little softer then I expected. Is there a trick to make them slightly more crunchy at least on the edges? I cooked them a few more minutes and it did not do the trick. Maybe I mixed in the raspberries too much and the fruit juice messed with the dough consistency? Hi Florencia! Hm, I’m not sure what to tell you. It’s possible that fresh raspberries would change the recipe, but I wouldn’t think it would effect the crispiness of the edge. Maybe try adding a couple tablespoons less flour next time? I came to this post so often that I just accidentally came here trying to go somewhere else, but that means it’s a perfect time to leave a reply! These were so good. I didn’t have a lemon but I did have limes, so I used them (and some lemon juice) to delicious effect. Rave reviews from everyone that tried them! I would like to try lemon sometime (because lemon is my favorite) but the lime was great. Also I just remembered I have one more batch in the freezer that I should bake up soon. That’s great news! Haha! I love that you just accidentally ended up here! Thank you for replying, I love hearing from you! I never thought to try this with limes, that sounds so good! Raspberry and lime is totally delicious together. Also, one of the best feelings is knowing you have a batch of extra cookies in the freezer. Lucky you!! Good to know these work with all butter Annie! I’m so glad you liked the cookies! Perfect for summer :) Thanks for commenting!! These are my husband’s new favorite cookie! 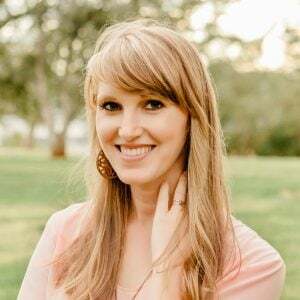 Love your recipes…please keep them coming! YAY! I love these cookies, so glad someone else loves them too! I will definitely keep the recipes coming, thank you so much for giving me some feedback! Means so much to me! These look amazing, I can’t wait to make them!! Thanks Kimberly!! I hope you get to try them soon. They are perfect for summer! Thank you! I love raspberries and I love lemons! And I loved these cookies. More to come for this weekend! It is just the best combo ever, right?? Thanks Sue!